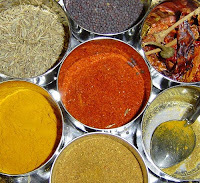 Curry powder may be doing more than flavoring your food! Turmeric, a spice found in curry powder, has been shown to have many health benefits. These benefits arise from curcumin, the main component of turmeric which gives the spice its rich yellow-orange color. In addition to having antioxidant properties, curcumin exhibits anti-inflammatory and immunomodulatory effects, all of which are important in disease progression. Several reports now show that curcumin has the potential to fight against Alzheimer’s disease, cancer, multiple sclerosis, diabetes, psoriasis, and cardiovascular diseases. In the case of Alzheimer’s, curcumin inhibits/slows the accumulation of amyloid plaques (dense deposits of beta-amyloid protein) in the brain of mice. Some suggest this may explain in part the low rate of Alzheimer’s disease in India, a population with prevalent use of curry powder and related spices. Reference: Jagetia, GC and Aggarwal, BB (2007) “Spicing up” of the immune system by curcumin. Journal of Clinical Immunology 27(1): 19-35. "Curry Spice May Fight Against Alzheimer's Disease"